Surely, there are various ways to promote your blog free online. Some of these include social network sites, community forum boards, blog and website directories, and blog networks. But this blog post will be focused on two notable websites: Digg and Reddit. Both sites can actually be considered as social media sites. They incorporate social networking to promote content from all over the web such as articles, videos, and music. Each one has a unique platform in driving traffic towards their sites, within their sites, and for sites being linked to them. I’d like to talk about each one of them individually and how they can be very useful to promote your blog for free. I’d call Digg the best among between these two. Joining is easy. Just fill up the registration form when you click on the tab for “Join Digg.” You can also sign up faster when you use an existing account in Facebook or Twitter. In my case, I chose the latter (as always since there’s not much on my Twitter account other than tweets). There is an issue with this though. You have to keep on signing in using the linked account from the chosen social network site every time. This means authorizing the app over and over again too. So you might as well just create an actual username and password. Once logged in, you can begin submitting links about your blog by clicking on the Submit Link button. Every site hates spammers however so you might want to slow down on the submission of links for your blog. Try to Digg around in between. You can read Digg it links from other users, vote up or down, and reply with comments. As for me, I was actually able to submit links to all blog posts I wanted to share, including articles from my InfoBarrel account without any problems. I did it one after the other too. I know, I just said no spamming but I was in a hurry. This ease of submission explains why I mentioned it’s the best between the two. But I hope you at least read the Digg FAQ first prior to participation in the community. Speaking of community, that’s how it works. The community of users votes a link up or down. The process is called digging and burying for up or down votes, respectively. The more number of votes there is about a link posted, the greater the chances of the link to be featured on the main page. This Digg feature is the first of its kind and other sites have adapted it since then, including its toughest competitor Reddit. Both Digg and Reddit are dubbed as social news websites and both utilize community voting to rate submitted news, articles, videos, and images to the site. Links with the highest number of votes gets the opportunity to be featured on the main page. As for registration in Reddit, it takes a few seconds to join with only a few questions asked like username, password, and a captcha (that anti-spam or robot filter which asks you to type in letters or numbers as they appear, for verification). Email is not even required when you sign up for Reddot. There is no Facebook nor Twitter integration though so you can’t sign up using existing accounts from those sites. Although registration appears to be easier in Reddit, there are limitations when it comes to submissions. Unlike Digg, you can’t submit all you can. You have to wait 10 minutes for each and after every submission and posting of comments. The only activity you can continuously do is to vote links up or down. Its either I have a problem with not reading terms and conditions (and following them) or there is an issue with the strict application of such TOS. Once again, I have a username banned from a site. See Banned from HubPages post. It’s the first Reddit account I signed up with. First, because I made another one after the other is banned. I understand how they hate spammers and they have a site based definition of it (which I yet again only got to read after I was already banned. I tried to get even by voting down every single post of the username which had me reported on the reportthespammers section but I noticed that nothing’s happening. So I contacted a moderator and found out that the username I initially used was indeed banned. I didn’t believe it at first because the account was still logged in, can vote, and respond to links with comments. Worst, I actually applied for the paid gold member service. There’s not much difference being gold members save for additional perks such as the so-called Lounge section which does not appear for free accounts. Also, I wanted to see if becoming a gold member will not have the username I use banned. I found out from one of the mods that it’s called “shadow banned”. A user can still practically do everything on the site but no one else sees what we’re doing except ourselves. It somewhat provides the liberty for banned members to appeal their case. Of course, I tried to do plea for help (a bit) but after a few hours or so, the user page does not appear anymore. Thus confirms being completely banned. Sounds like there no sense in the shadow banned status since you’re going to be eventually banned for good anyway. It’s a waste time participating when other users can see what you’re doing. Also, you’re still accepted for gold membership (I say an extra buck on their pockets) even if you’re already banned which is a rip off. I filed a dispute through a PayPal about the gold membership payment, but it was set to pending status. There is a wait time of 45 days after the transaction date in question before anything can be done. So I’ll let it rest for now and see if there’s something they can do about it. Going back to promoting your blog through Digg and Reddit, I understand that it takes hundreds or even thousands of up votes for your blog post to even be noticed but the moment it was submitted, thousands of readers already have access to it at once. Whether it gets featured or not, you have already gained readership when you submit links which redirects back to your blog. If your post is interesting enough for other members to notice, it will naturally be voted up. Should you wish to find help, you can send notification to everyone you know through email or social network sites to let them know about Reddit or Digg. Who knows, they may already be members and vote up for you. You can even install a Digg widget (none for Reddit as I’ve checked) directly to your blog particularly after the post being promoted so readers from the blog can vote it up. I’d stick around with Digg more often now but I may try Reddit again after the whole drama is over. 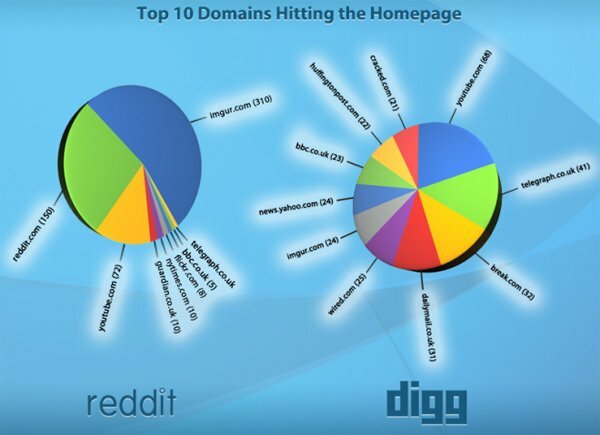 I still prefer Digg too despite the fact that Reddit have outrun Digg in the web rankings (at least by one notch). As for you, I hope you can try either one of them to promote your blog free. You know...the TOS are clearly posted at all these sites. If you can't be bothered to read them then you're obviously going to end up getting your account banned at some point. Maybe you should take a few minutes reading the TOS rather than "save time" by not reading it and then spend significant amounts of time posting content that will only be deleted.